I love the work of Australian illustrator, Bruce Whatley, but I wasn't familiar with Samantha Berger's writing. After reading Martha doesn't say sorry! I will definitely be on the look-out for this team in the future. Published by Little, Brown and Company (2009), it's a charming picture book that will have kids giggling, but I suspect it will also make them think about Martha's problem. You see, Martha never apologizes. She does all sorts of other co-operative stuff - she shares, hugs, makes presents for others. But when she does the not-nice things, like poking out her tongue, or throwing or kicking, Martha doesn't say sorry. Soon we see the consequences of Martha's rude behaviour. When she wants things like cookies, piggyback rides and hugs, her family members just aren't inclined to give them to her. At last, Martha realizes she needs to make some changes. The illustrations are large, and full of quirky charm. In Martha, Whatley has somehow morphed an otter and a human to create the perfect character for this picture book. We can all relate to someone who is quite snooty about what they will and won't do. Berger's text is perfect - just enough to tell us what's going on, with the nuances left to the illustrator. Like all good picture books, there's humour, repetition and great rhythm. "Fwa?" asks her baby brother. 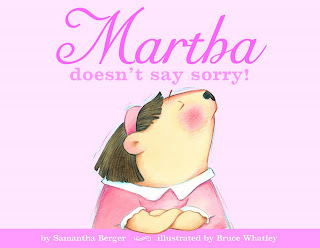 Martha doesn't say sorry! is a story kids will ask for over and over again. It would make a great addition to family, classroom or public libraries. I'd suggest follow-up discussions about co-operation and how to get along with other people. Children could also use the book as a model for their own writing about a young character with a problem.